Is this the best omnidirectional treadmill for gaming yet? The Oculus Rift headset could very well be the breakthrough that virtual reality has been waiting on. But there are still a couple of major hurdles to overcome as it relates to supporting hardware – specifically, I’m talking about how to physically traverse while wearing it. Since it’s tethered via cables, walking about freely isn’t exactly an option (never mind the fact that you’d be bumping into all sorts of nearby obstacles). Some have come forward with solutions to this problem but most have been less than impressive thus far. 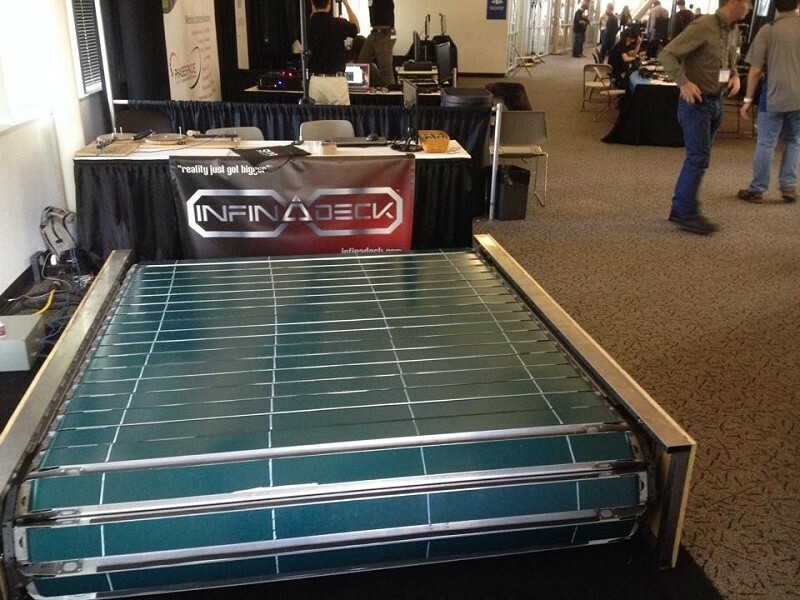 Enter the Infinadeck, an omnidirectional treadmill that allows you to walk in any direction at nearly any speed without ever stepping off the edge of the platform. The device was recently on display at the inaugural Silicon Valley Virtual Reality conference and as Gizmodo points out, it looks a bit more refined and compact than other omnidirectional treadmills we’ve seen but it’s still far from perfect. In its current state, the user must manually adjust the speed and direction of the belts. Fortunately, Infinadeck’s creators are working on a number of improvements like built-in motion and tracking sensors to eliminate the requirement. Of course, the oculus rift and gaming in general is only one potential usage scenario for the treadmill. Some will no doubt be interested in using it for exercise purposes or perhaps for other uses that escape me right now.